I have a slight memory. 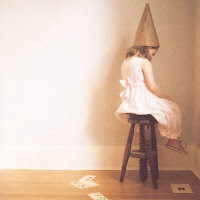 Sitting in the corner with a dunce cap on. Not me. (Of course). Just fear that I might. Do something wrong. Stupid. Not be smart. All would know. This was a punishment that could happen at my school. When I was young. As I have looked at shame this dunce cap corner sitting practice came to my mind. I am glad we know better. I was curious. How, why, when did such an idea make sense. Adults calling kids stupid. Children. Click here if you want to know too.